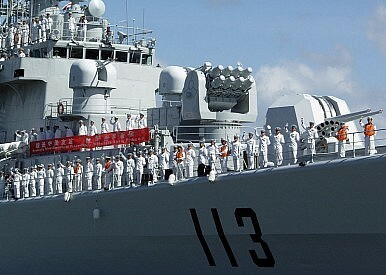 ‘Similar drills and exercises will keep taking place,’ a People’s Liberation Army Navy spokesperson said this morning. The Chinese People’s Liberation Army Navy (PLAN) is conducting a routine planned naval exercise in the Western Pacific this week, Xinhua reports. Liang Yang, a military spokesperson of the PLAN stated that Chinese navy vessels and military aircraft passed through the eastern portion of the Bashi Channel, situated between Taiwan and the Philippines, this morning. The vessels and aircraft went on to conduct several drills that simulated real combat conditions in the waters east of the Bashi Channel, including long-range precision strikes and aerial combat. The exercise is part of the PLAN’s annual training plan and was “in line with international laws and practices,” according to the military spokesperson. “During the drills there was no impact upon freedom of navigation or fly-through in the relevant seas or air,” he additionally noted. He did not supply specific information on what type of vessels and aircraft, as well as the number involved in the exercise. The PLAN announced this week on it official Weibo microblog page that the waters east of the Bashi Channel have been designated as one of two training areas – the other being Miyakato Strait – for routine drills and exercises conducted by the Chinese navy. Sputnik News reports that PLAN is simultaneously also involved in the second stage of the joint Sino-Russian “Joint Sea 2015” maritime exercises in Russia’s Far Eastern Primorsky Territory, which is taking place on June 8-11 and will include, among other things, amphibious assault drills. Chief among these challenges is the integration of increasingly complex modern weapons and equipment platforms. Equally important is the training of PLAN personnel who are not currently fully prepared to operate or maintain them, which appears to be a major concern for the Chinese navy, given the volume of PLA literature published on this issue. Other challenges include the mastery of such capabilities as antisubmarine warfare (ASW) and amphibious operations, where the PLA has significant limitations. The lead ship of a new class of Chinese guided missile destroyers commenced first sea trials on August 24.